Work by 2nd year Textiles students has been praised as being of a ‘very very high standard’ by a visiting team from clothing company H&M. 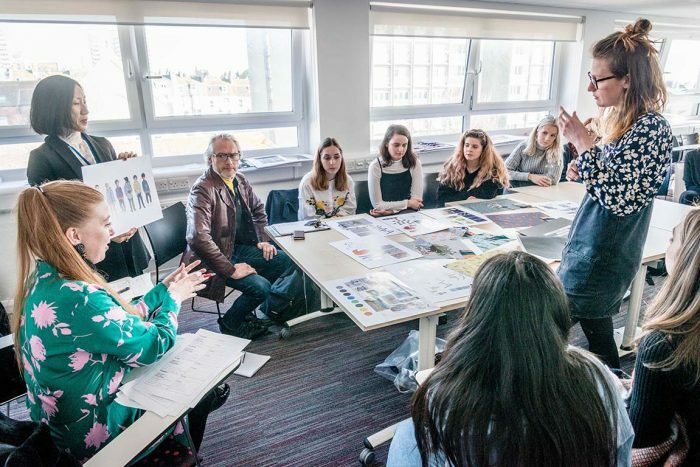 The students were taking part in a project to design a collection for the company which they presented to H&M print designer Lorna Anderson and HR manager Maria Olofsgard who had flown in from Stockholm. The students were praised for their strong projects: “If you brought me any of these projects in industry I’d be impressed” said Lorna. Students could also win the chance of a placement with H&M in Stockholm- an announcement will be made later this week. Update: The team from H&M were so impressed with the designs that four students: Harriet Parsons, Elena Branch, Ella Miele and June Srinurak have been chosen to go on placement with in Stockholm. Congratulations to all of them! This entry was posted in Fashion and textiles, Uncategorized and tagged H&M.